Since I plan to get another decade or so of use from my Alienware P2 case, I’m designing a static lighting solution for my system. 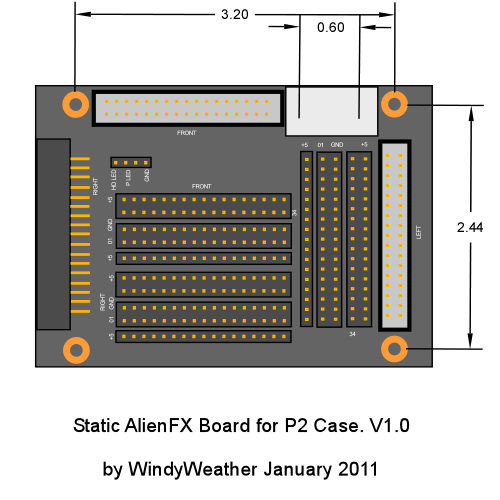 By static I mean a board that mates with the existing connectors for power and LEDs, and allows setting the colors, but does not support animation, and does not require any drivers, or USB connection. Anyone with this case and a recent version of Windows or Linux, will benefit from a lighting solution. Support the Alienware P2 case and use the existing mounting, power, and LED connections. Not require any drivers, operating system support, or USB connection. Allow the colors of the various zones to be changed manually by changing jumpers. Be flexible so that the design does not require detailed determination of the LED wiring before the board is built. Here is a first idea for a board layout. The dimensions may not be exact since I have not measured the AlienFX board, but they are approximate based on the pin separation of the MOLEX power connector. The connectors are the same as the AlienFX board from Alienware. The power connector is a traditional Hard Drive power connector. The LED connectors are IDC Floppy headers, 34pin and keyed. The headers for the Front and Left of the case are vertical and the header for the Right is a right angle version. There is a header for the Power LED, HD Activity LED and GND. Apparently these are inputs to the board from the motherboard so that these signals are mixed with the AlienFX colors/ animations for the Front zone. More investigation is required for how this should be handled. In order to control the LEDs, jumpers are placed on headers to connect either +5V or GND to the connections in the IDC headers. Of course the +5V is current limited with a resistor to drive the LEDs. For each LED header of 34 pins, there are 5 rows of 17 pins: +5v, Signal, GND, Signal, +5v. The headers are placed so that .1″ jumper blocks can connect either +5 or GND to each signal pin. It will not be possible using these jumpers to connect GND to both a pin and it’s complement. For example, pins 1 and 18 or 5 and 23. If this is required a jumper wire will be required. How to handle the HD and Power LEDs. Perhaps just allowing these to be jumpered directly to the Front zone will suffice. An extra header and wire jumpers might suffice. Looking at the wiring of the LEDs to determine whether the suggested jumpering system will require too many wire jumpers. Determining the resistance required to limit the current to the LEDs. A friend of mine may be able to help layout the board and then I’ll need to contact a board fabricator to build a few prototype boards.